Olive oil and balsamic vinegar tastings are the new wine tastings. Head to A Twist On Olives and take your taste buds on a delicious adventure! If you think all olive oils are created equal, you’ve clearly never been to A Twist On Olives in Westerville. This cute store is owned by a sassy lady by the name of Rosa. She jested that when she and her husband retired, she needed to start a business so that they wouldn’t get divorced! So four years ago in April she started A Twist On Olives. Her niece actually introduced her to these products after visiting a similar store in Cleveland called Olive Scene. Rosa fell in love with the concept and opened her own store. But don’t be fooled, this is no franchise and Rosa says she has the gray hairs to prove it! But she clearly loves what she does, conveying her passion for the products to everyone she talks to. We also met Megan, the creative director at A Twist on Olives and the mastermind behind Twisted Tuesdays, which features a new creative recipe every week showcasing different ways to use the products other than just dipping or making dressings (not that that isn’t an exceptional way to enjoy them). If you sign up for the e-mail, you will get the inside scoop along with 10% off the featured items of the week! We were lucky enough to sample some of her creations. But before I get into specific flavors of the oil and vinegar I should probably tell you about their selection. Their store has 3 different oil sections. 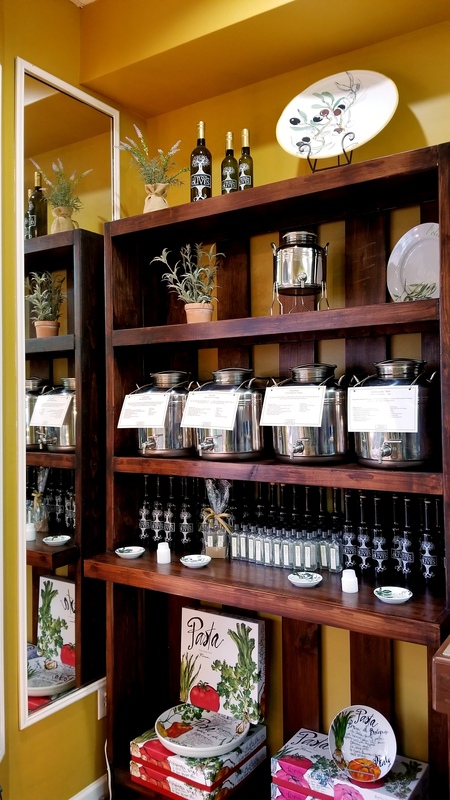 The tall containers (pictured above) contain single varietal olive oil which literally means they are made with a single type of olive. Why should you care? Because the olive oils you find in the grocery store are typically a blend. Each container in the store is adorned with a card indicating their Intensity, crush date, type of olive, what to pair it with, and suggested uses. All of their oils are extra virgin and cold pressed which means no heat is used to extract – therefore the health benefits remain intact! The second section is for the infused oils which come in more flavors than you thought possible, which are infused after the olives have been crushed. The top selling infused oils are the garlic and Tuscan herb, as they are both great for pretty much everything from bread dipping, sauteeing veggies, drizzling over pizza or pasta, making frittatas – you name it! Not to be confused with infused oils, the fused olive oils found in the third section have their flavor components crushed simultaneously with the olives instead of infusing after. The most poplar flavor is the blood orange which was featured in the incredibly delicious brownies we ate! Megan used a Ghirardelli brownie mix but instead of vegetable oil used the blood orange olive oil and for good measure added the zest of an orange (get the recipe HERE). Another popular olive oil is the lemon which was also used instead of vegetable olive oil to make cupcakes with a box of Duncan Hines cupcakes (get the recipe HERE). These are just a few little cheats Megan shared to jazz up boxed mixes! Just like wine tasting, there is a method to tasting oil. A true connoisseur will drink oil in a blue glass to prevent preconceived notions based on the color. But regardless of your glass, we were directed to place our glass in one hand with the other on top, rub to warm, then sniff and slurp. Yes literally slurp. A mild oil will have a little burn at the end. We also noticed that th oil did not feel greasy which we learned is a sign of freshness. In contrast, a robust olive oil will have a peppery and grassy flavor that burns the back of the throat. Rosa assured us it was a characteristic of the oil and that she wasn’t trying to poison us! We were worried ;-). If you are vegan and miss the flavor of butter, then you’re in for a real treat because they carry a butter flavored olive oil! This oil is made with a non-dairy plant based extract which mimics the taste of butter. Just think of the possibilities! Great for popcorn, scrambled eggs, grilled cheese – basically any time you’d cook with butter. For example, another of Megan’s creations was crostini topped with balsamic onion, pears, and blue cheese. The caramelized onions were cooked in butter olive oil and also the balsamic vinegar (get the recipe HERE). Megan also shared her twist on pesto which was made with walnuts, resulting in a similar mouth feel but cheaper than using pine nuts! And instead of all basil she used parsley as well. Then she used both Sicilian lemon and garlic olive oil to finish it off. But she didn’t stop there, this epic pesto was then used to marinate mozzarella before skewering and drizzling with balsamic (get the recipe HERE). As expected we inhaled these as fast as everything else. Speaking of balsamic, there is another section dedicated to all kinds of balsamic, including both white and dark. Yes, there is such a thing as white balsamic! White is made the exact same way but isn’t aged as long. Dark is aged in wooden barrels and takes on the characteristics of the wood-just like when you age beer, spirits, or wine in barrels. Just like the olive oil, there is an array of flavors which may raise the question of why would anyone buy the traditional? Because it’s amazing! But if you are looking for something different, one of their popular flavors is the lemon balsamic which was in the lemon water they served. Just add lemon to water, balsamic to taste, and serve over ice cubes! With all these flavor options, which rotate every 6 months, it’s hard to imagine picking a favorite. Rosa is purist and her go-to is the medium single varietal. However, she admits that her favorite changes every week. At the moment she favors the Tuscan herb because she doesn’t have to add a lot of other ingredients to get great flavor. She also loves making a cranberry-pear vinaigrette with the blood orange. But being Italian she puts the garlic olive oil in everything. Doesn’t sound like a bad plan to us! As for Megan, her favorites vary by the season, such as the wild mushroom and sage in the winter. But she always uses the butter oil to grease her pans instead of nonstick cooking spray. After listing a variety of oils she has to have in stock all the time, she went on to joke that she can’t afford not working here – “I look like a bag lady when I leaves for the day!” Heck maybe we should all get jobs there because we definitely all left with at least one bottle of oil and/or vinegar to take home! The Green Olive Package ($100): includes the private tasting description plus an appetizer and dessert to sample made with our EVOOs and balsamic vinegars. As a special gift, guests will receive a 60 ml bottle of a featured oil or vinegar from the evening. The Black Olive Package ($150) is what we did and includes the private tasting description plus two appetizers and two desserts to sample made with our EVOOs and balsamic vinegars. As a special gift, guests will receive a 60 ml bottle of a featured oil or vinegar from the evening.